Growing up in Hurricane Utah, just 20 minutes from Saint George, I have fond memories of jumping out of bed, running barefoot to the window and peeking out in wonder at the blanket of snow covering my backyard; but that was a very rare occurrence. The majority of my winter days were spent running around outside rarely ever needing a coat. It wasn't until I moved to Logan Utah for school and later Salt Lake City for 10 years that I came to understand what winter was all about. I must confess that even though I do love the snow, my love for snow is tainted a bit by the fact that I do not like the cold. I am a Southern Utah native after all. During my winters living in Northern Utah, I would find respite from the cold by making regular trips back to my hometown in Southern Utah. 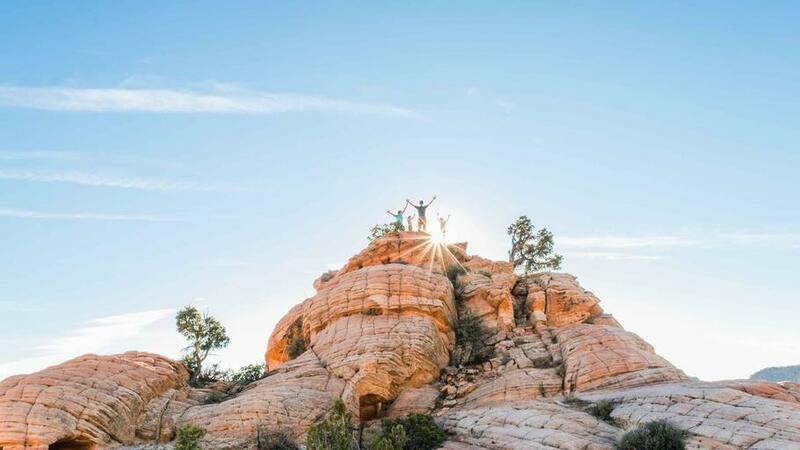 Known for its mild winter temps and an unlimited supply of hiking and outdoor activities, Southern Utah is one of the best places out there to ditch the puffy coat and replace it with hiking boots and a backpack. I moved back to Southern Utah with my husband and 3 kiddos a little over three years ago and believe me when I say we take full advantage of the Southern Utah winters. Summers are hot and crowded with tourists, so when winter rolls around with cooler temps and the tourists find their way back home, we go out and play. 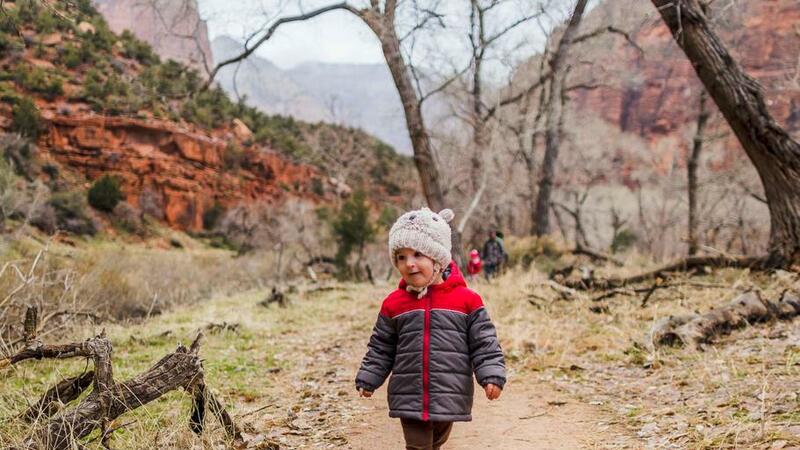 I have put together a three-day itinerary perfect for any family itching to escape the cold with swirling red rock and desert adventures. Start your day by fueling your adventure with a Haven Waffle or BO-rrito at the Xetava Garden Cafe in Ivins, just 15 minutes northwest of Saint George. After breakfast drive 6 miles to Snow Canyon State Park. This stunning park is scattered with volcanic cones, sand dunes, lava flows, and soaring red sandstone cliffs. Just 1/4 mile past the south entrance you will come to Jenny's Canyon trail to your right. 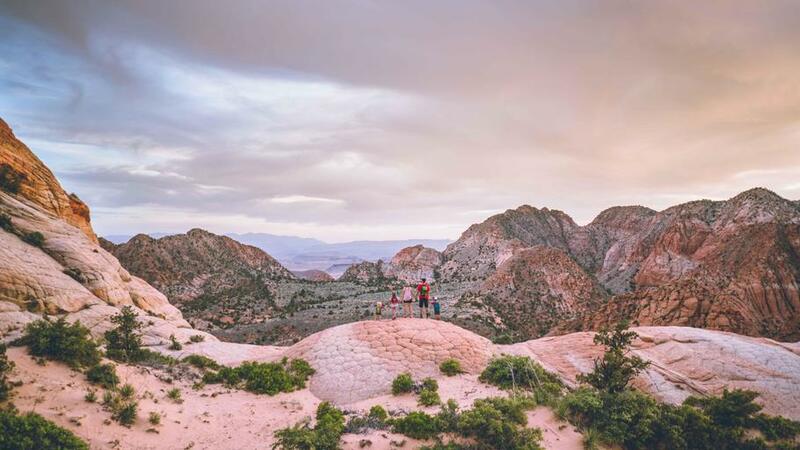 This 0.3-mile round trip trail will take you to a towering slot canyon on your left and an overlook to your right. 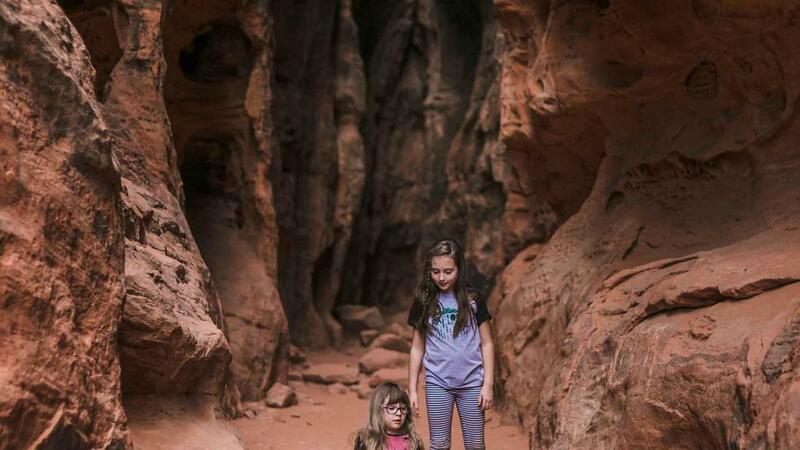 The slot canyon is ideal for exploring and kids can even do a bit of rock climbing on the canyon walls. After your short hike, head up the road a short distance to the Sand Dunes. This giant-sized sandbox is the perfect place to let the kids run, play and dig to their heart's content. Once the kids have had enough fun playing in the sand, drive north to the Petrified Dunes. The parking lot will be to your left and a short trail will take you to incredible rolling mounds of petrified Navajo Sandstone. 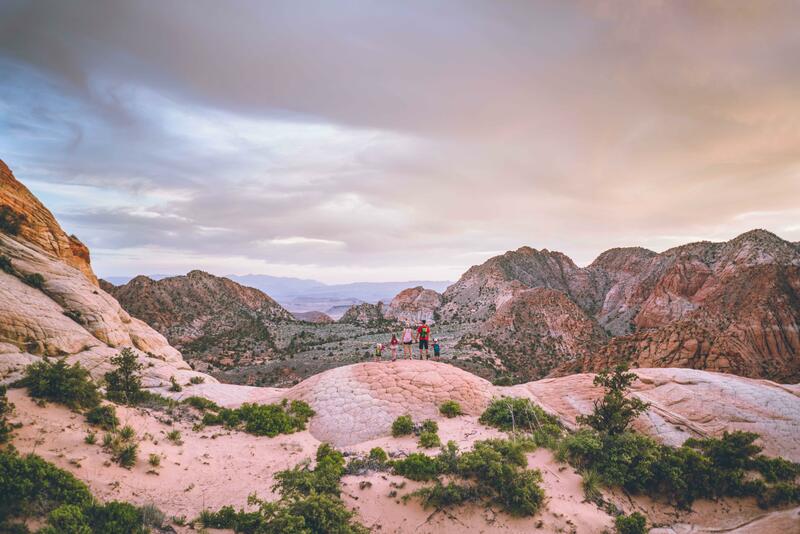 At the heart of Snow Canyon, the views from the top of the once-flowing mountains of sand are some of the most breathtaking in the park. Don't worry about following a trail, just climb, explore and enjoy the beauty until everyone is ready to head back to the car. Later in the afternoon, head over to Yant Flat. This mostly flat trail starts with soft sand along the lower forest at the base of Pine Valley Mountain. The easy 1.5-mile round trip hike will take you to open terrain of swirling smooth rock formations that spill out for miles. The landscape can be steep at times, and there are cliffs to be aware of, but the sticky rock will allow kids to adventure across much of the area. Day two is an action-packed day full of adventure and is perfect for a family looking to push outside their comfort zone. 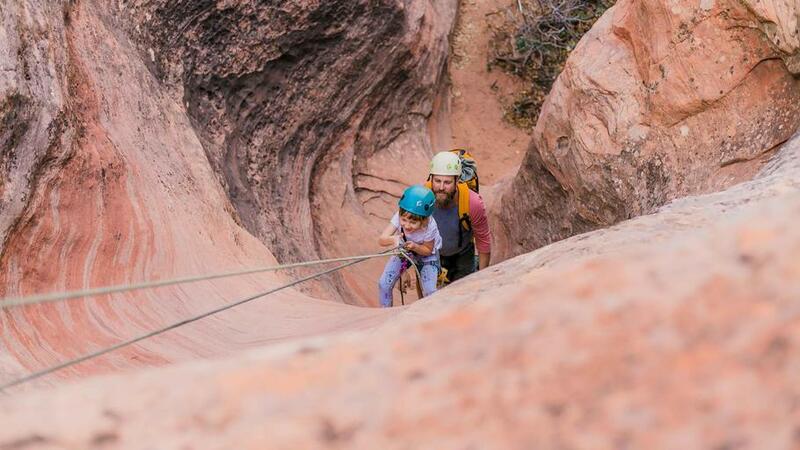 Book a half day morning family canyoneering package with one of the local guide companies in Springdale. Red Desert Adventures is one that I highly recommend. The location of your canyoneering adventure will be selected with regards to starting location, season, and conditions. Age 4/5 is usually the youngest family member they will take. After an adventurous morning repelling beautiful slot canyons, head over to River Rock Roasting Co. The pizza, sandwiches, and salads are all excellent and the views from the patio can't be beat. Make sure to take an Aunt Betty's cinnamon roll for the road. After lunch, make your way 25 miles east to the Water Canyon trail. This hidden gem of a hike just outside of Hildale has a shallow year-round creek and a stunning waterfall reward at the end. At 3.5-miles round trip, the trail can be a little more advanced due to the moderate elevation gain and tricky rock scrambling. Start your day by visiting the Zion National Park Visitor Center to get a Junior Ranger Handbook for the kids to work on throughout the day. If the shuttles are running, jump on and ride it to the last stop – Temple of Sinawava – where you will hike the Riverside Walk trail. If the shuttles aren't running, make sure to get an extra early start so that you will find parking. Parking is very limited in the canyon. The 2.5-mile round trip Riverside Walk trail is mostly level and paved, making it doable for all skill levels. Shear red rock mountains and hanging gardens line the path as you walk along the Virgin River. The end of this trail is the beginning of one of Zion's most popular hikes in the summer, The Narrows. Bring a picnic lunch to eat on the lawn in front of The Lodge. After lunch, walk across the road to the start of the Emerald Pools trail. This classic Zion hike is great for kids and features one of the few waterfalls on display in the park. Hike 0.7 miles to the Lower Emerald Pools. Instead of heading up to the Middle Emerald Pools follow the Kayenta trail. This 0.8-mile trail will take you to The Grotto shuttle stop. You can then follow a beautiful path along the river to get back to The Lodge. 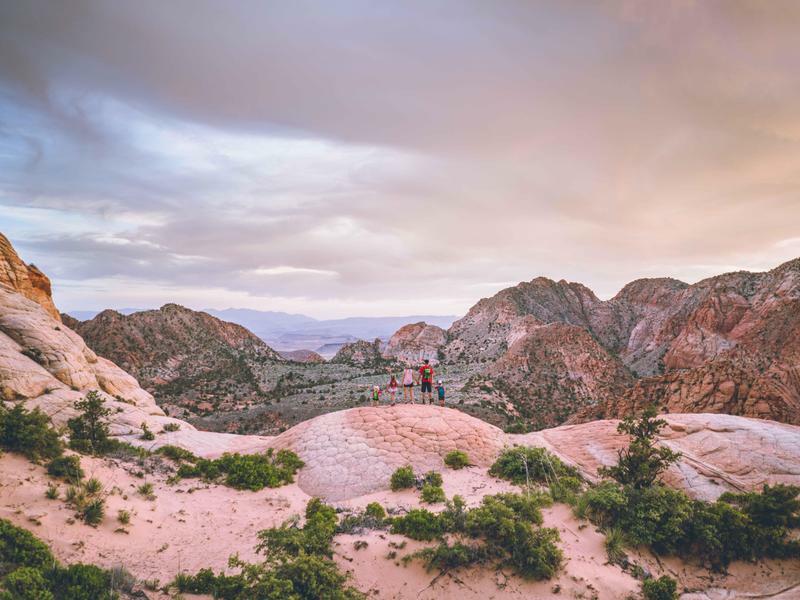 After your day of hiking, make a stop at the Natural History Museum to watch a 20-minute film about the history of Zion. This film is a required activity in the Junior Ranger Handbook. 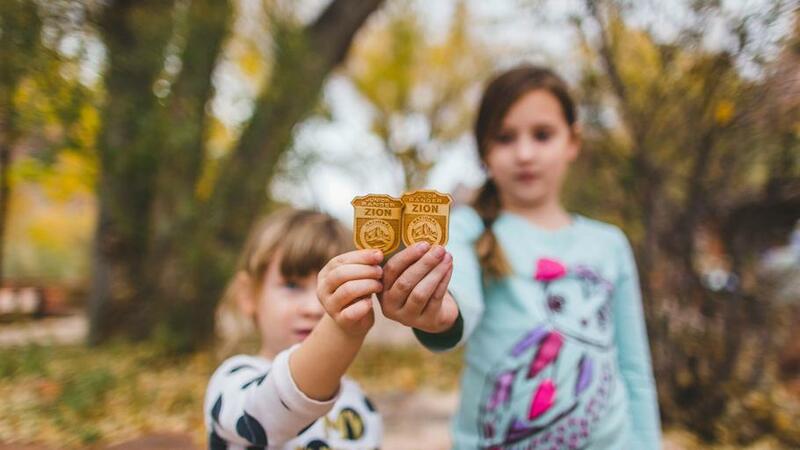 Finish up the last of the Junior Ranger Handbook, then head back to the visitor center where your child will present their completed handbook to a park ranger and take an oath to protect and care for the National Parks.